Utilizing our latest machines and high tech tools, we have cemented ourselves as a top Manufacturer, Supplier and Exporter in the industry. 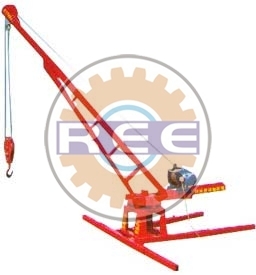 We offer Monkey Hoist to our admired customers at nominal price. It boasts arresting features such as elevated service life, low maintenance and industry-proven design. Our tremendous distribution system enables you to get it delivered to your doorstep in no time at affordable prices. We are one of the prominent organizations engaged in offering a wide range of Portable Monkey Hoist to meet the varied requirements related to the material handling requirement of the Construction Industry. These precision engineered product is suitable for basic hoisting requirements of relatively light equipment/material. We offer these sturdily constructed and dimensionally accurate products in load capacities of 500, 1000, and 1500 lb. (227, 454, and 680 kg). Note : Capacities will vary based upon height of mast and length of reach.